32,000 cyclists. 40 miles. 5 New York boros. 1 Englishman. 0 cars. January 2015 – By a bizarre coincidence, I’m out for a Sunday ride with my local cycling group Abingdon Freewheeling and discover that one of the riders out with us, Ali, has done the 5 Boro Bike Tour in 2014. After a few chats we agree to do the 2015 event together. I get myself registered for the event, arrange a hire bike, and commit myself along with 31,999 other cyclists to take the Tour on 3rd May 2015. 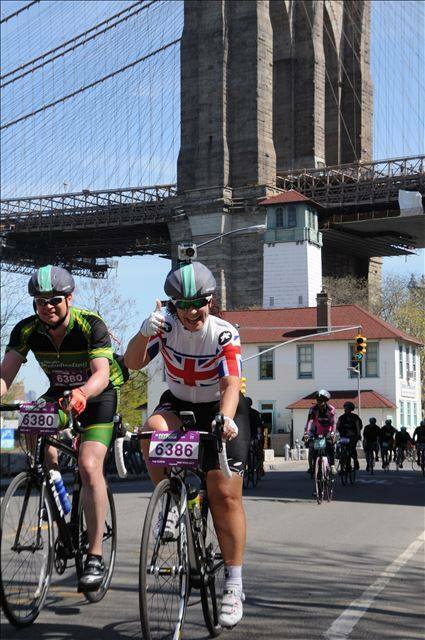 1 May 2015 – After getting to New York and checking into my Brooklyn apartment, I take the subway to Manhattan and pick up my bike, from the Bike n’ Roll hire shop in Battery Park. After getting the bike checked over, adjusting the saddle and fitting my own pedals, I take my first few faltering pedal turns around Lower Manhattan and Chinatown. 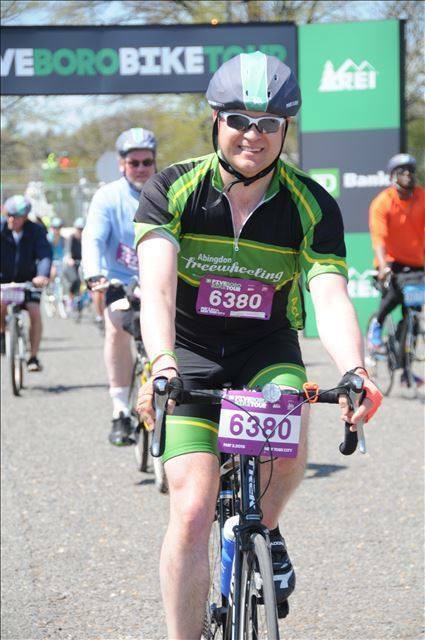 3 May 2015 – After a few practice runs over the last few days around Brooklyn’s Prospect Park and Coney Island, I’m on my way to the start line for the 5 Boro Bike Tour. It’s an early start as I meet Ali at 5.30am in Brooklyn to take the subway back into Manhattan. By 6.30am we are at the start line on Greenwich/Trinity/Church street – well, about ½ a mile from the start line really, as there are thousands of riders already here in front of us. There’s a great atmosphere, with bikers of all shapes and sizes as we shuffle our bikes through the start line and further into Manhattan. The great atmosphere continues as we are met with roadside rock bands in Queens and the Bronx. We pass landmarks such as Radio City Music Hall and Central Park, and we cross over the many bridges that join up Manhattan Island. The entire event is on closed roads, which is quite a feat of organisation in this city, so it feels safe and comfortable. The sun shines on us, and we finish all too soon at Staten Island. We take the ferry back to Manhattan, passing the Statue of Liberty. 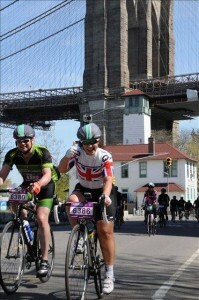 And just for an encore we bike back over the Brooklyn Bridge. I can’t recommend this ride highly enough, particularly as the entire event is run by volunteers from NYC’s leading cycling non-profit, Bike New York, whose stated aim is “to facilitate and promote cycling as a safe and sustainable means of recreation and transportation.” Just like our very own Broken Spoke! 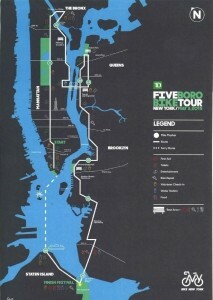 They run education classes all over the 5 boros, and have even taught the residents of Sesame Street how to ride. 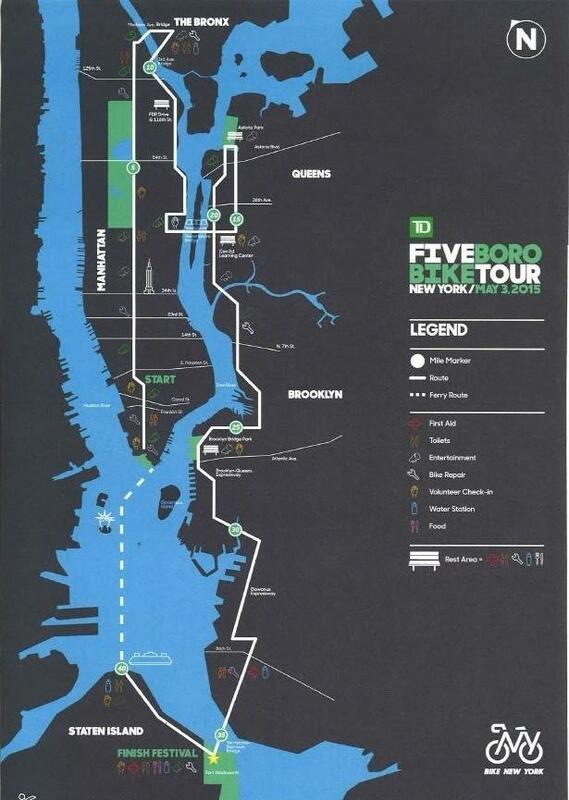 If you’re thinking of riding the 5 Boro Bike Tour I’d recommend signing up to their mailing list and keeping an eye on the Facebook page. The ride sells out very quickly, as do the hire bikes, but if you plan early you won’t be disappointed. And you can take your bike practically anywhere on the New York subway, so it’s easy to get around. Yay!